The Cycloergometer Calibrator is a portable device that measures the running torque required to rotate a crankshaft of a wide range of cycle ergometers at a selected speed to derive the breaking power in watts or Kgm. This is achieved by combining a powerful source of rotary motion and a precision load cell with an electronic means of control and monitoring. The instrument is delivered with a set of mounting and interfacing tools. Up to now there was no way to calibrate a cycle ergometer, so the question of accuracy of test data was politely ignored. Experience has shown that many, if not most, ergometers are either inaccurate to start with or lose their accuracy over time. 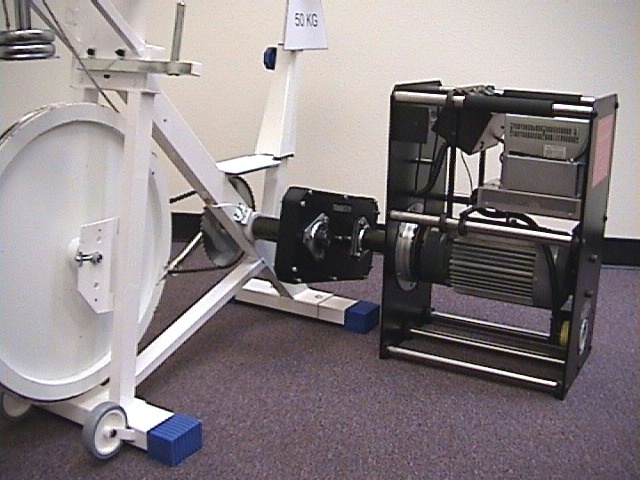 VacuMed's calibrator accurately measures the braking power of any ergometer up to 1500 watts. Consider the effect on the accuracy of a study where one ergometer under-reports power by 20%, the other overestimates the power by 20%. How to make this Calibrator pay for itself: Be the first in your area to offer a calibration service to calibrate ergometers owned by other laboratories, stress test labs, hospitals, rehab departments, etc. Reliable data from studies involving multiple ergometers Confidence in your published data and their interpretation. Accuracy: +/- 0.5% or +/- 1 watt, whichever is greater. Accuracy of Torque: +/- 0.01 kg.m. Range of Torque Measurement: 0 to 25 kg.m. Range of Cadence: 45 to 125 RPM standard. Accuracy of Cadence: +/- 0.25 RPM for the range of 40 to 90 RPM, otherwise +/- 0.5 RPM. Digital Display: Watts, Kg.m or RPM, switch selectable. Display Resolution: For speed 0.1 RPM, for torque 0.01 kg.m. Power Requirement: 200 - 240 VAC, 20 Amp max. Adapters available for most ergometers, price includes a $500 credit towards adapter of your choice. Additional adapters extra. Lode (post 1996?) requires Adapter 17800-1. Lode (pre 1996?) requires Adapter 17800-2. Monark (post 1998?) requires Adapter 17800-1. Monark (pre 1998?) requires Adapter 17800-3.